Contemporary design and colour. 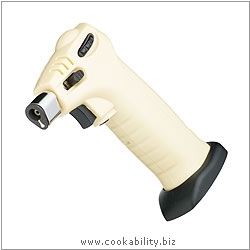 A refillable cooks blowtorch with adjustable flame and peizo trigger ignition. Anti-flare at all angles and upto 45 minutes use per filling. Ideal for crème brulee, also can be used for skinning peppers and tomatoes.